2K Games has now revealed the full soundtrack listing for NBA 2K19 today. Much like every year, the soundtrack includes bands and singers from a variety of different genres. 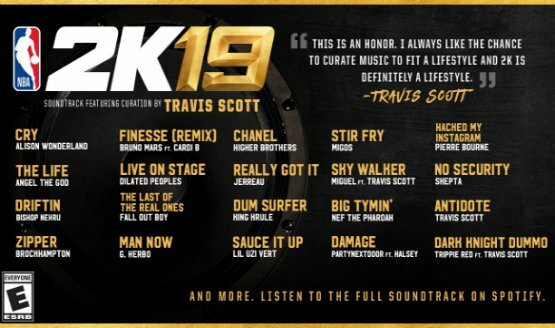 Rapper Travis Scott has been named as the “curator” for the NBA 2K19 soundtrack. This basically means he chose all of the songs to be featured in this year. You can see the full list for the soundtrack posted down below. NBA 2K19 releases on September 11th, 2018 for the PC, PS4, Xbox One and Nintendo Switch platforms. For more on the soundtrack, check out the video below.